How To Brine Corned Beef , and then use it to make the best Corned Beef and Cabbage you’ll ever have. When I learned eight years ago that my ancestry was part Irish, I figured it was also time to learn how to brine corned beef. 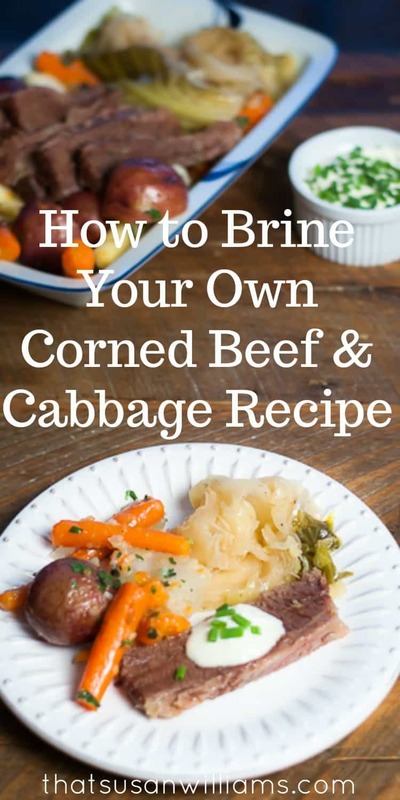 So, not only will this easy stovetop recipe tell you how to brine your own corned beef, it will also deliver the very best Corned Beef and Cabbage recipe I’ve ever had. Now, if I were seeking to cook *truly* authentic Irish food, I’d probably just learn to make a proper lamb stew, with potatoes. But wouldn’t you know it? My husband doesn’t care for lamb. So much for that. One time, maybe 10 years ago, we were invited over to an Irish family’s home here in Middle Tennessee on St. Patrick’s Day, and *that* family was having Corned Beef and Cabbage. So until my husband and I travel to Ireland, the land of me mither’s people, the Irish home we visited in these parts will have to do as my role models. But the trouble with that idea was….their Corned Beef and Cabbage dish was fairly mushy and low on flavor. So, challenge extended: how do you brine corned beef? And, how do you make an absolutely DELICIOUS, FLAVORFUL CORNED BEEF AND CABBAGE? Challenge accepted! I wanted a recipe that would produce a flavorful, non-mushy, better-than-your-average supermarket package of brisket with pickling spices in a packet inside. This recipe BY FAR outdoes all other corned beef recipes that I have tried in the past. I would not steer you wrong. The effort required to brine corned beef, on your part, is to simply remember to purchase the brisket a bit earlier than you normally do, so that it can enjoy a few leisurely days (or hours) of lounging around on your fridge shelf, submerged in an aromatic brine. What’s “Corn” Got to Do With Corned Beef? The answer to that question is: pretty much nothing. Corned beef is generally made from a cut of beef called brisket, that is then “brined” or “corned”. The term “corned” came from using small hard particles or grains or “corns” of salt. Who knew? Because brisket is a tough cut of meat, it benefits from low slow heat and moist cooking, or braising. Cooking it “low, slow, and wet” helps the collagen in this typically tough cut of meat to break down. The brine is actually the same type of solution that you might use in making pickles. But don’t let that concept put you off. Brining does GOOD things to brisket! You can see the horseradish sauce I made in the foreground. All my guests love it! I learned the basic process of how to brine corned beef from reading a recipe by Tyler Florence, of Food Network. 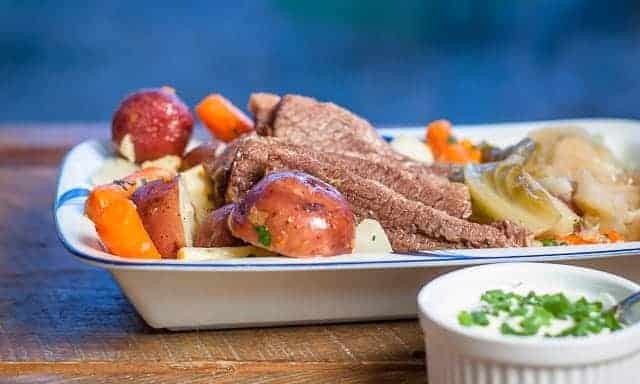 But then, I added my own special touch to this dish, by adding a super-simple horseradish sauce to the beef – because I love how the flavor of horseradish perks up beef. Both the wonderful flavor and the tenderness of this corned beef made this the BEST corned beef I have ever tasted. The directions to Tyler’s recipe say that you can brine your brisket for as little as overnight, or even up to 10 days. I brined mine for about a week. It was fantastic. The longer the brining, the more “pickled” the beef will be. So, plan your meal, factoring in your available time, and when you’d like to serve the dish. How To Brine Your Own Corned Beef , and then use it to make the best Corned Beef and Cabbage you'll ever have. This solution can be used to brine the beef for as little as an overnight brine, or for up to 10 days. (I brined mine for a week, and it was fantastic.) Combine all the brine spices in a large non-reactive bowl, and place the brisket in the bowl. Rub the spices into the exterior of the brisket. Pour in enough cold water to cover the meat. Weight the brisket down with a plate so that it stays submerged. Cover the whole bowl with plastic wrap, and refrigerate until the day you are ready to cook it. Heat a large Dutch oven over medium-high heat and add the olive oil. When oil is hot, add the onion, carrots, celery, garlic, marjoram, and bay leaves and cook until veggies start to soften, about 10 minutes. Remove the meat from the brine and rinse it well. Set the meat on top of the veggies, and add water to just cover the meat. Bring to a rolling boil and skim away any foam that surfaces. Reduce the heat to a simmer, place the lid on the pot, and simmer for 15 minutes. Add the cabbage wedges, cover, place in oven, and cook for 3 hours. About a half an hour before the meat is ready to be taken from the oven, prepare the Herbed Root Vegetables. Put the olive oil and butter in a large pot over medium-high heat. Add the vegetables and toss to coat them well with the fat. Season with salt and pepper. Add 1 c. water, and bring to a boil. Lower the heat to a simmer, cover the pot, and cook until the vegetables are tender. Start checking them at 20 minutes to be safe, but it took my veggies about 30 minutes. Toss the veggies with the butter, and sprinkle on the herbs. Whip the cream till peaks form (I whipped mine in my blender), and then fold in remaining ingredients. When the beef's cooking time is over , remove beef from pot and tent it with foil on a cutting board. Let it rest for 20 minutes. Remove the cabbage wedges from the pot, and place them in a serving dish. Cover them with foil. When meat has rested 20 minutes, trim the fat from the meat, and slice the meat against the grain. 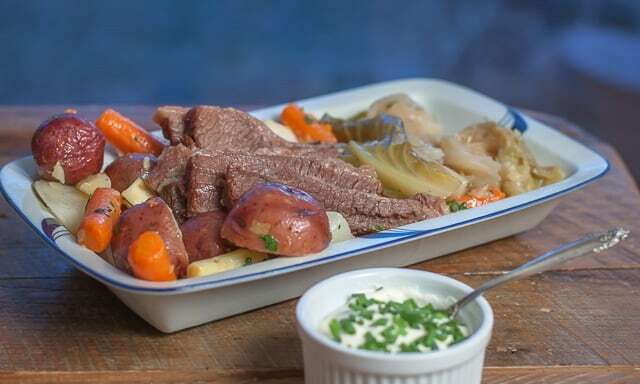 Serve the meat with a spoonful of horseradish sauce on top, and with the cabbage and the buttered Herbed Root Vegetables. If you have any leftovers, and good luck with that (! ), you can use it in my wildly popular recipe for leftover steak hash. In the meantime, I know you’d love to help me out (in return for all the work I’ve saved you doing the research) by sharing this recipe on Pinterest or Facebook, wouldn’t you? Sharing is caring! Please share this on Pinterest, or Yummly, or Facebook, or wherever you share good recipes.